On Remembrance Day of victims of the Holodomor in the St. Sofia Cathedral in Kyiv took place a joint inter-confessional prayer for those who died from hunger. 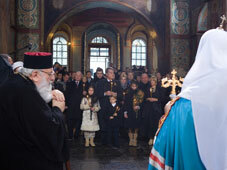 The prayer was conducted by the heads and authorized representatives of churches and religious organizations of Ukraine. From the side of the Ukrainian Greek Catholic Church for the victims of the Holodomor prayed His Beatitude Lubomyr, Major Archbishop of Kyiv and Halych. In St. Sofia prayers to the Lord were heard by the President of Ukraine Viktor Yushchenko together with the wife Mrs. Kateryna Yushchenko and their children, higher public state officials, in particular the prime minister of Ukraine Yulia Tymoshenko, secretary of CNSDU (Council of National Security and Defence of Ukraine) Raisa Bohatyriova, vice prime minister Ivan Vasyunyk, ministers, national deputies, representatives of KCSA (Kyiv City State Administration) and public organizations, intelligentsia, and others. This information was reported by the official web site of the President of Ukraine. During the last two and a half months the Apostolic Administrator Dmytro Hryhorak OSBM in the presence of many diocesan priests conducted solemn inauguration ceremonies of the following churches after the completion or renovation (interior). They also celebrated the holly masses in connection with parish visitations. 2. 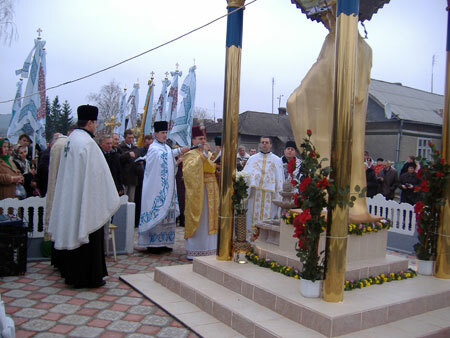 October 14th, 2009 – a parish feast in the city of Zalischyky. (Parish visitation). This sunny day many people were waiting impatiently in the area of the monastery of the village Ustia-Zelenyj for this event. And now it was the time. On the 15th of November the residents of Ustia-Zelene and the Catholics of the surrounding villages gathered to consecrate in a dignified manner the Mother of God’s statue, erected in the village center. On this occasion the Apostolic Administrator of the Diocese of Buchach Dmytro Hryhorak, OSBM attended the local parish. The community members and many believers met the leader of our diocese with bread and salt, according to the Ukrainian church custom, near the church. Pupils of local schools dressed in the national clothes greeted the present guests. Pastor of the church, father Stephen Striletskyj, gave symbolic keys of the church to the administrator of the diocese Dmytro Hryhorak OSBM. Today, on November 29th, 2009, Synod of the Ukrainian Catholic Church was started with the celebration of the Divine Liturgy of John Chrysostom in St. George's Cathedral in Lviv. 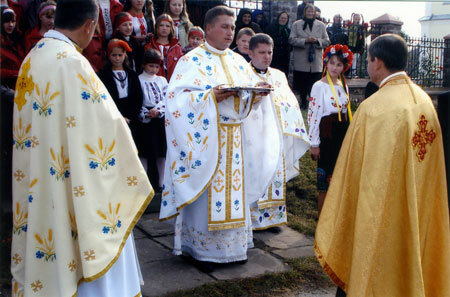 The meetings which are chaired by His Beatitude Lubomir Husar, the head of the Ukrainian Church, will continue throughout the week up to the 5th of December 2009. 49 bishops (along with Emeriti) currently belong to the Synod of the Greek Catholic bishops of the Ukraine. 36 bishops, who represent the Ukrainian Greek Catholic Church in various countries around the world, came to Bryukhovychi( suburb of Lviv) in order to take part at the meetings. Becides different other topics from the life of the church, the question of appointment of new bishops in the dioceses will be discussed.